I made several photographs of these Great Egrets quite a while ago but I never felt like the images really expressed the extraordinary experience of being with these graceful creatures. I say ‘being with’ because I was standing in the water not too far from them – there was no long lens in my camera bag that day so I was pushing my luck. Anyway, I have played with this image a little, adding a layer of … recollection, I guess. This what it feels like to wade with the egrets. Beautiful photo! You can hardly see what is sky and what is water. Yes, like a gentle memory – the lines are blurred. Then I have made a successful image. Oh, Karen …they are floating in serenity! Serenity yes, that was it exactly. Lovely. I had a similar experience with white swans. It is magical. Lucky you, a gathering of swans would be lovely. Thank you. I’ve seen some wildlife pictures in my time and I can say you be created something pretty awesome here! what a beautiful image, Karen! I’m glad you think so, thanks very much! Thank you, Louis. It was an honour to be among them – at the fringes, anyway. This is a fantastic image Karen. I feel it. Got goosebumps! Marina, I love that it gave you goosebumps. They are amazing creatures, aren’t they? Thank you! So much silence, peaceful vibes in the clouds and the reflections of the clouds. This sets a wonderful mood and the birds are stunning protagonists on this stage. A very poetic shot! Oh, those birds are quite regal characters, are they not? Thanks for your very kind words, Roland. A layer of recollection, like that. Very nice, I think I will steal it. Watch for it returning soon. Oh, oh, oh, thank you. Thank you for your appreciation, Brenda. Sincerely. So so beautiful – enchanted, mystical. Thank you for sharing what it feels like to wade with them. That’s an image I’d like to live with! Seedbud, such a great comment, thank you! I’m happy you get the sense of the experience. meditative Karen.. it is surely THE most tranquil of images.. It was a meditative moment. I’m happy to share it with you, Helen. Thanks ever so much! Hi Karen, Marvelous nature image. Your images are beautifully visually and I am always impressed how they convey a mood so effectively. Your titles are apt, as well. Thank you! Much thanks for your feedback, Jane. I’m glad you enjoy my work. I really like this image and what you have done with it. As indicated by other commenters, it is so ‘real’ and tranquil. The birds are delightful. The egrets are beautiful to watch. Thank you very much! Wonderful mood and feeling Karen, very nicely done. This really is so beautiful..like a classical painting almost, with the finest of brushes., but just completely your own as always! I really do love it. Love your description, Cath. Thanks very much. This is an amazing image Karen. I’m glad you think so, Tom, thank you. A lucky opportunity, really. That’s what I love about photography – you never know what you might find.
. . . I need to start merging my images . . . and it will take me years to get to this stage. amazing how you did it. All elements are present and expressed in harmony . I want to visit that place too. During my passage of observation , I saw all elements , all details . All needed to be present , none to keep away . LOVE, love, love this piece. I’m speechless. Heavenly. And I do believe the earth and its creatures are our heaven. Thanks, Karen. In the UK We have the smaller cousin “the little egret” and I too have struggled to capture the atmosphere but to get a shot of a group of egrets without a long lens is miraculous ! I love the extra layer ! “…adding layers of recollection….” Oh I love that. I love the layer of…recollection, Karen…such a beautiful photo…that atmosphere we do find in our memories….very nice. Very serene. This is very nice. A beautiful image. 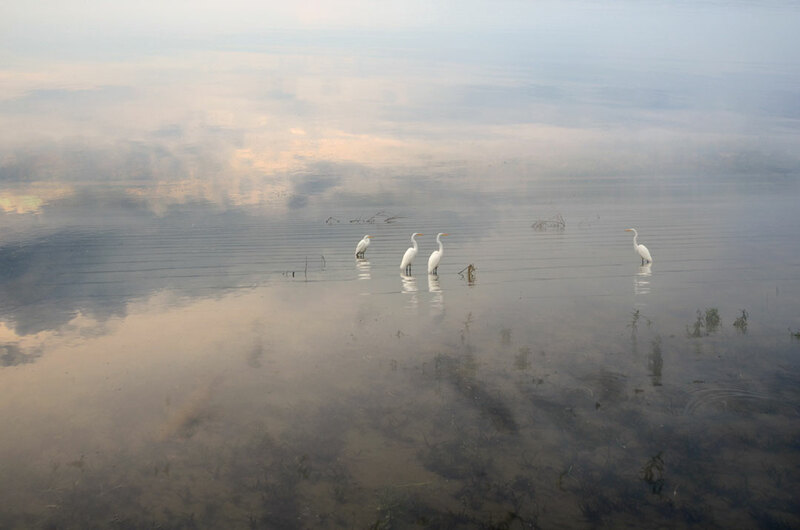 So ethereal and peaceful…the birds even seem at peace and unconcerned by your presence. I can’t imagine that it was ‘more’ than that–though I know that standing there in the water, it had to be more, and then I remembered the few times in my life when I was in a situation so beautiful I did not bother to take a photo (because it would have been worthless) and looking at your picture made me see (however truncated) what you saw–and those times that I could not take a picture too. Magical like an old painting, a picture from the mind, an adventure. You really did a great job, Karen, picturing your experience! It looks magical, Karen. So soft and dreamy. I’m glad I didn’t have to put on waders but I imagine it was good being out there with the egrets. Beautiful photos for a beautiful blog ! Very very nice Karen. The layering works so well. And it must have been a terrific experience to wade out with them. Did you feel as if you were growing white feathers when you entered their habitat so gently? No, I felt more like a bit of an ugly (uncoordinated) duckling in their presence, but they didn’t seem to care. Thank you, it was pretty cool! It’s as though they are standing on clouds … breathtaking! I like this one, too. I was considering hanging it up somewhere in my house. I’m really happy you like it! My blogger friend Karen (who is an amazing artist and photographer) over at DrawandShoot took this exquisite photograph. I just had to share it. Thank you, a magical sort of moment being among egrets! Hauntingly beautiful image. I love your photography that for me captures the aesthetic of the sublime, blurring macro. and micro., for me its like a nostalgia about loss and the landscape as momento mori. Thank you for liking my posts. Elaine, thanks very much for your comments. Your art work and the meaning in your paintings truly resonates with me.I think we may be kindred spirits in our relationships with the land and the water. Like a dream ! So inspiring ! That’s a nice description, Lynn. They do seem like they are holding court for an important discussion. They are majestic birds. I like this photo!! Is very beautiful!! Thanks very much! I’m happy you do, it’s one of my favorites.